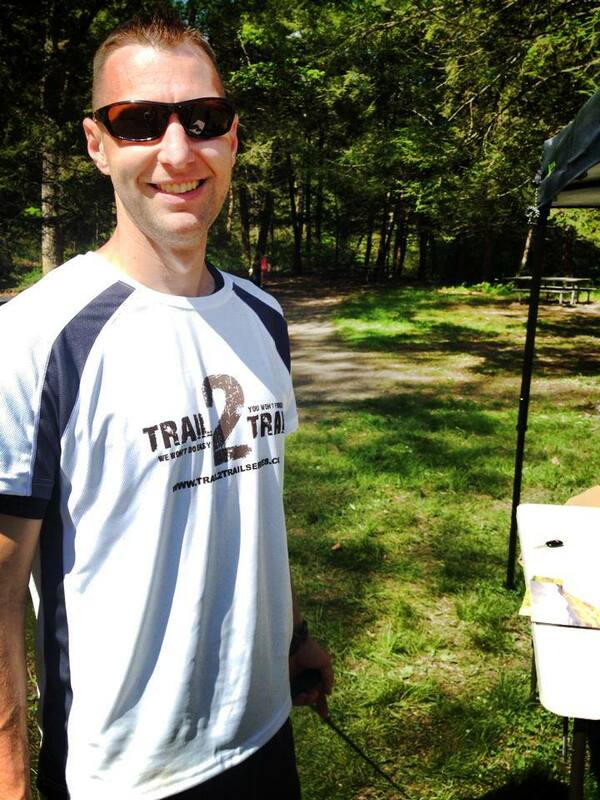 We welcome the Pomperaug Trail-AdventureChallenge. The Pomperaug Trail in Southbury and Oxford primarily parallels the Housatonic River (Lake Zoar) on the high western bank and ridge running south to north. It is a beautiful trail, many parts challenging that you ‘won’t forget it’. There are 12+ miles in this event. One who signs up should have some experience with trail running and should have atleast finished equivaluent to a trail 20k or 1/2 marathon. One must be able to follow blue-blazed markings since there will be limited T2T markings during this event. This should be a great fall trail run. Come and join all your fellow trail-runners for camaraderie and great trail run. A race to enjoy. 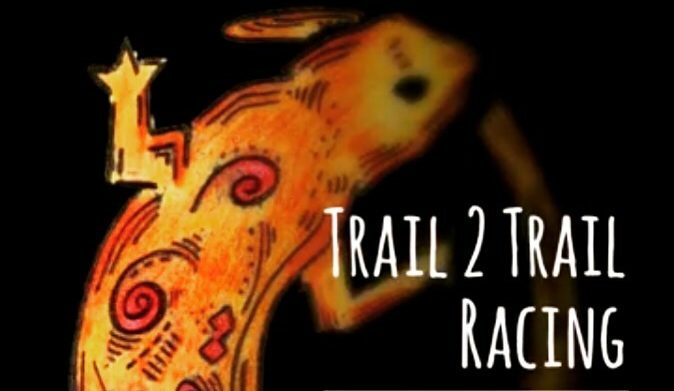 This is the fourth year as Trail 2 Trail Series. Most of our events are based at state parks. We continue to search and explore many trails in anticipation of future events. The race Starts at Kettletown State Park at the beach area. Park just before the beach at Kettletown State Park. 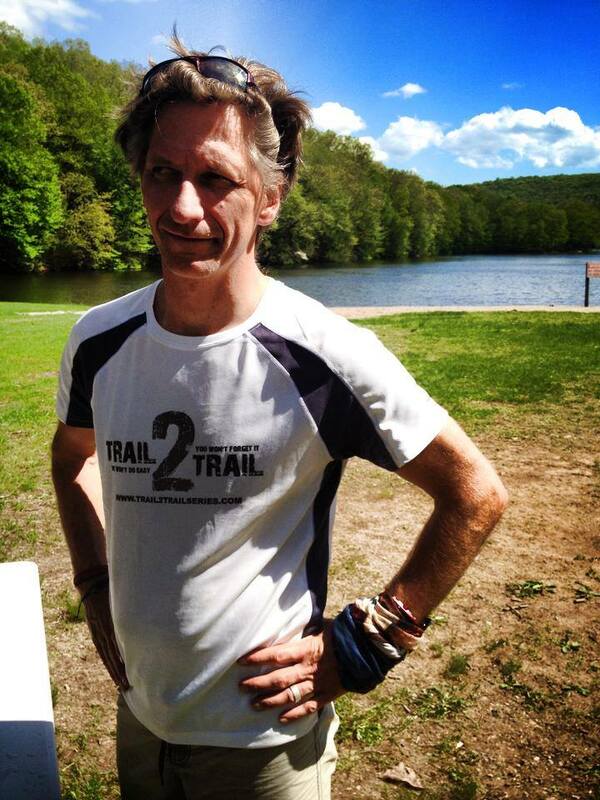 We will start at the same place we have our annual Kettletown State Park Challenge Race every May. When you are at the beach, walk past the bathrooms and you will see us there. The park opens at 8am. We will start setting up at that time. Please check starting at 8:30am. Race starts at 9am. We typically end up starting the race approximately 10 minutes past the stated time, to allow those who are running late, so no need to rush. This race will start off like the Kettletown State Park Challenge where the start is at the beach area, and heads north-east starting across a bridge and following the Blue-Yellow blazes. This trail will eventually lead to the Pomperaug, blue blazed trail. Once you cross the wooden bridge, take a left to follow the Blue-Yellow blazed trail which parallels a stream (on your left going out). The Blue-Yellow blazed trail will end at a road that you will cross. 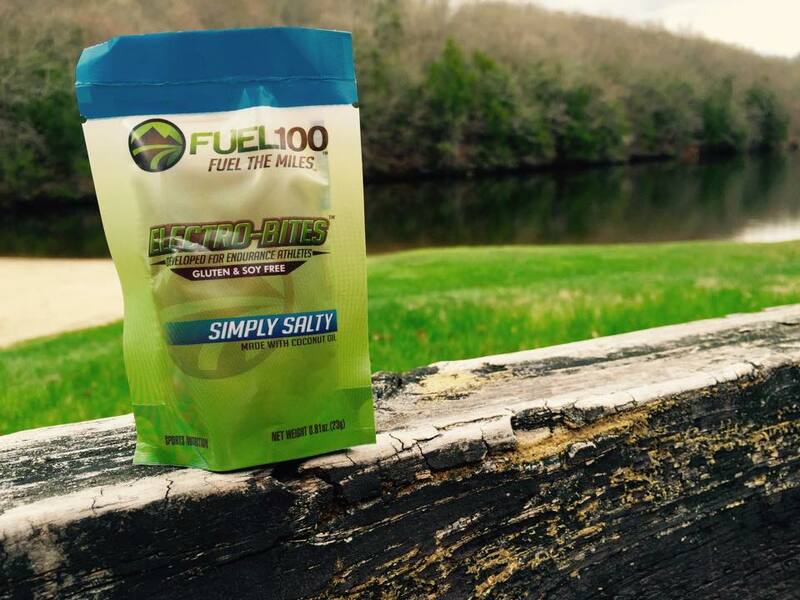 Once crossed, you are on the Pomperaug Blue Blazed trail. The Pomperaug Trail is relatively easy to follow. It is recommended that you have a basic understanding how to follow trail Blazed markings since we don’t expect to add any additional markings. We may have some “confidence” markings (orange ribbons) along the trail at certain points to help guide your way. Don’t rely too much on these ribbons since they will be used sparingly on the trail to help you identify the blue blazed trail. The existing Blue blazes are easily identifiable and are well seen throughout the trail. Once you start on the Blue Blazed Pomperaug trail, stay on it until you reach the turn around point at Fiddlehead road. There will be other blazed trails out there; avoid following those trails since you will be off course. The Pomperaug will follow Southward to Fiddle head road going out and Northward after the turn around heading back. The first part of the Pomperaug (0.55 miles) you will pass the crest trail (Blue-White blazes), pass the Camp ground trail (Blue-Red blazes). Passed the Camp ground trail (Blue-Red blazes) you will follow (0.81 miles) up toward some rocky terrain, where you may feel like you have to scale up and down them. Eventually you will come up to another sign; continue to follow on the Pomperaug trail to Jackson Cove. Here you will travel downhill to Jackson Cove, which is where we will have am aid station before you continue into the woods. After Jackson cove, you continue on the Pomperaug trail; in approximately 0.10 miles will meet up with another sign which will point the way to the Pomperaug trail. Stay on the Pomperaug and follow this up and down some cool narrow terrain that crosses a stream (a tree is conveniently laid across for your travels) and then continues up and down on some well maintained trails. This area has a mixture of trails where you can coast, with some challenges in between. I can say it is one of my favorite section of trails. There are many narrow paths and rocks need to climb over and around that will make you glad you have continued this far. You will eventually end up at Fiddlehead road; the is the turn around point; congratulations you made it this far. You may have a slight saddened thought that this is the end of the trail, but then will feel happy that you will do it all over again in reverse. 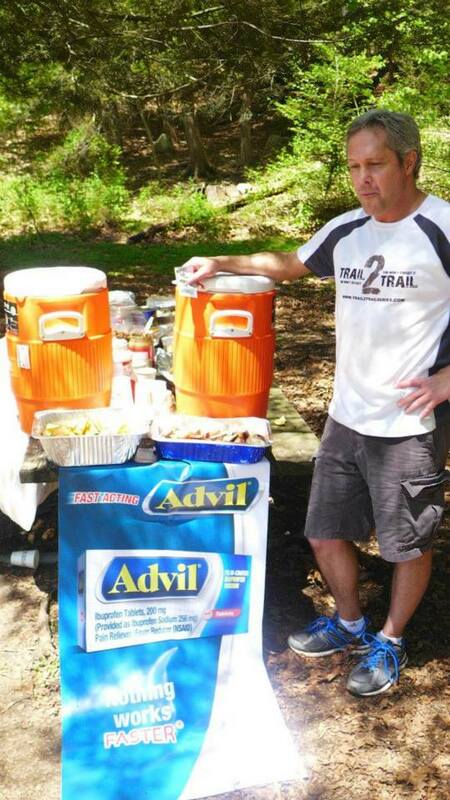 We will have an aid station and a staff member taking down your bib number at Fiddlehead road. Please make sure your bib number is recorded, otherwise you will be considered DNF (did not finish). Return back from Fiddlehead road in reverse. Paying mind to stay on the Blue Blazed Pomperaug trail. Continuing to the north end of the Pomperaug, crossing the park road and following back on the Blue-Yellow blazed, Southwestward where the stream will be on your right; cross the bridge and there is the finish. Make sure we record your bib at the finish. We always encourage to bring a cell phone with you in order to have the trail information on and just in case of an emergency. If you find that you are having a problem and/or unable to continue racing the event, try to make it to back to once of the aid stations. We can arrange to pick you up to bring you back to the start. The race will begin at Kettletown State Park Beach area. You will find staff and the check in tent. Check-in will begin at 8:30 AM (0830). This will be at the Start/Finish area. 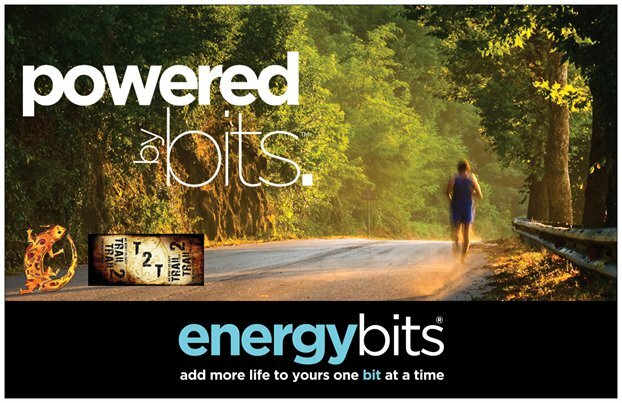 (bib numbers will be updated days before the race. Please follow the link to look for your bib number. We will have a list in alphabetical order on race day). The start will be 9:00 AM (0900). The cut off time for all races is at 12:30 PM (this gives you 3.5 hours to complete your race). We encourage registration via on-line. 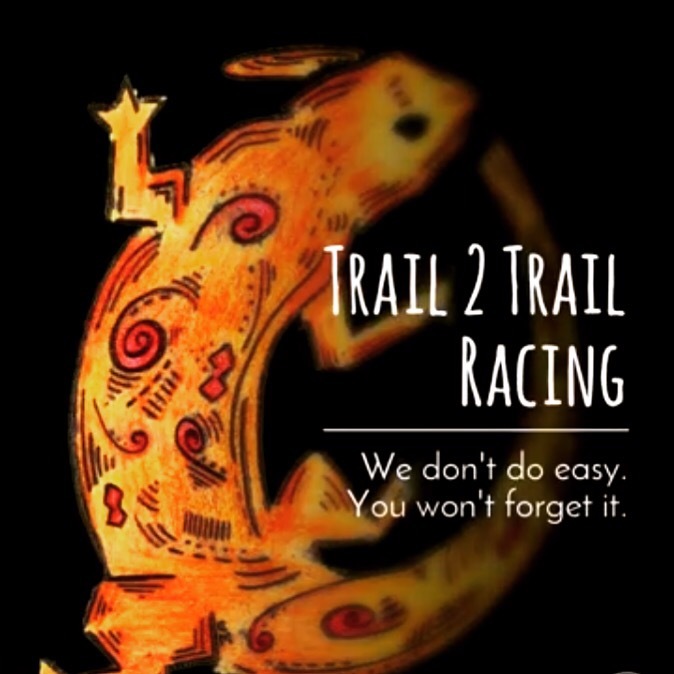 If for some reason you were unable to register on-line, we will only accept checks (made out to Trail 2 Trail Racing LLC). Cash exchange is otherwise not allowed on the premise. We have extended the online registration end time to try to include those who are late participant registrants. It does help the race directors and staff greatly if you register early, since their is a lot of last minute logistics that go on within the last few days before race day. 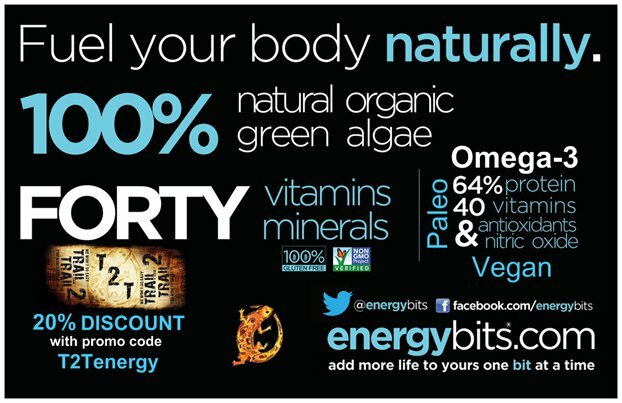 There will be 3 Aid stations. One at the Start/Finish, at ~3mi, and 6mi out. You will return back passing the mile 3 Aid Station. 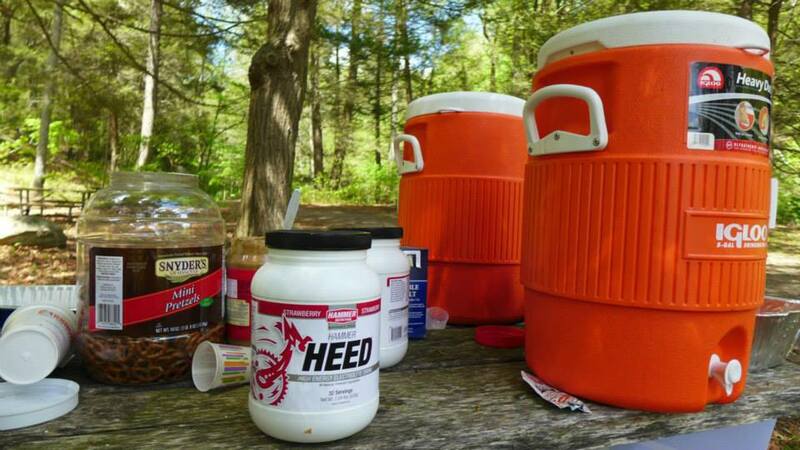 The main aid station will consist of the following: Water, Fuel 100 Electro-Bites, Bananas and Oranges, HEED electrolyte drink, and Endurolyte supplements. Their will be another unmanned aid station that will consist of water. We encourage that you bring a handheld water bottle, or the like, to keep it ‘green’, although cups will be available. You will follow the existing Blazed Trail. You must have basic trail knowledge in order to follow the blazed trail systems. Leaving the Start (at the beach), you will follow a short white blazed section of trail that starts you across a wooded bridge. You take a left after the bridge continuing to follow the white blazes adjacent to a stream which will be on your left going out. This will lead into the Blue Blazed trail system: the Pomparaug Trail (Blue Blazed trail). You will follow the Pomperaug till the turn around point, following back on the Pomperaug which will lead back to the short white blazed trail (stream now on your right) following across the wooded bridge to the beach -> the start/finish location. Each participant will receive a special custom T2T series beanie. Next Next post: Registration Opened for 2018.